These little reusable snack bags are environmentally friendly and just plain fun. Who wouldn't want to stash something in these? Carry snacks, tiny toys, personal items, and other important stuff. Handy to toss into a backpack or briefcase. There's been some discussion about what kinds of materials are safe to use in reusable food bags. Many sources are now saying that the old standbys, oil cloth and vinyl coated fabrics (PUL), release plastic toxins into food. A good lining alternative seems to be rip-stop nylon. It's moisture and grease resistant. I've chosen to use the rip-stop nylon. Use what works for you and your family. The lining comes in a variety of colors. The bags are 6" by 6.5", fully lined, no raw edges, and they hold over a cup of snacks. They're machine washable, but most of the time you can just turn them inside out and brush the crumbs off. These reusable snack bags are based on a tutorial by HaftaCrafta. Depending on the fabric pattern, you can get 2 to 3 outer layers from one fat quarter (a commonly sold piece of fabric that is 18" by 22"). Is someone you know a fan of super heroes? I made one to take dog treats with me when the dogs and I go for walks or training sessions- I love the fun print! 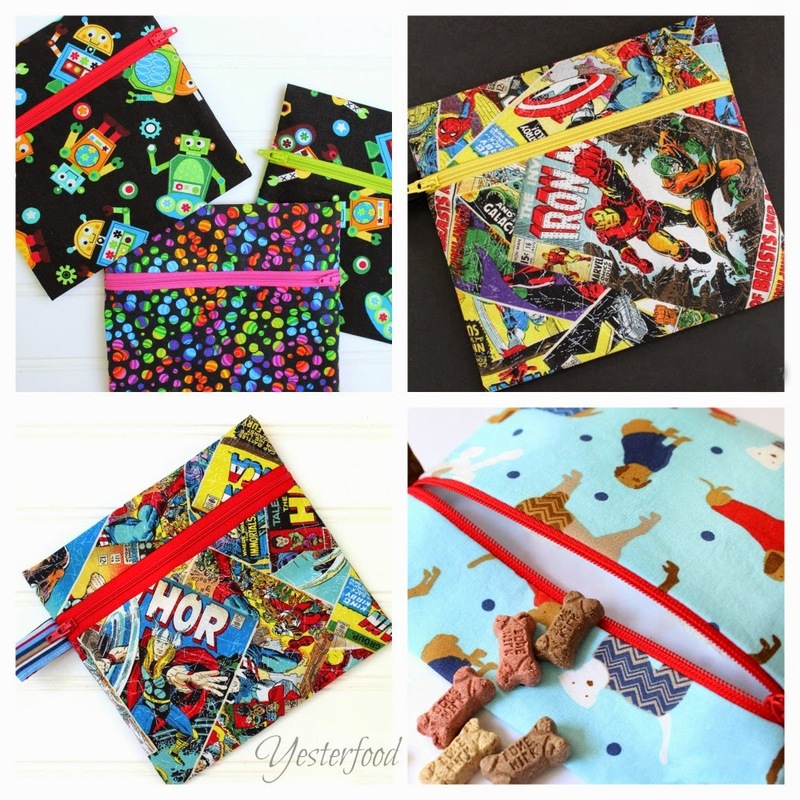 I made several of the Reusable Snack Bags in the Robot and Super Hero prints for a child's birthday party as party favors for guests to take home- the kids loved 'em! I had a few left over and put them in my shop. Come take a look! Those really are cute and I bet kids would love them -- I can see Amara now scouring her room for things to put in them! This would be a best idea for me, haha. I don't like to throw away tons of plastic bags! I'll have to look into these. Oh my goodness I need about 10 of these cuties! Great idea! I just bought some rip-stop nylon today, believe it or not! Perfect for the coming craziness of school starting! You amaze me at how talented you are. You could easily sell all your things. These snacks bags are adorable. I am thinking they would also make very cute pencil bags for this time of year too. I love them! I pinned them twice and tweeted twice. Will share more very soon! Thanks for sharing the tutorial! Sounds like a great excuse to get out the sewing machine. I especially love the idea of one for dog treats - I hate having kibble crumbs in my pockets! I'm glad I found this at Motivational Monday today! Such cute snack bags...my children would have loved them...they are adults now! What a great idea for young mothers...thanks for sharing! These are cute, but I'm sure my daughter would use it to store her pens!!! Stopping by to share these cute bags some more. Love these, pinned them!! Stopping by from Time for Mom! Your Etsy shop is great! Thanks for stopping by to share these cute and useful little bags, I love the colors! I love this idea! It'd help so much in cutting down waste with ziploc baggies! Thanks for sharing these! I love these! The ones at the store are so expensive and these are much cuter! Such cool fabrics you've used! I use rip-stop nylon for my fabric food wraps too! Love the choice of your fabrics. I should make some of these so we don't waste any ziploc baggies. Thanks for sharing on Merry Monday. So fun and cute! I'm obsessed with the superhero one. Thank you for linking at the In and Out of the Kitchen Link Party. Hope to see you again next week. What a great idea to use nylon for the lining. Thank you for sharing at Sharing Saturday! Thanks for sharing with us at the #WWDParty! Those look brilliant, so fun and practical. Thanks for linking up to Sweet and Savoury Sunday, stop by and link up again. Have a great day!! So stinkin' cute! Love them! Love the bags and fabric choices. Thanks for linking up to Gingerly Made! Thank You for stopping by Inspire Us Tuesdays and leaving some inspiration behind. We would love for you to visit each week and leave some inspiration, find some inspiration, and borrow some of these ideas for yourself for the future. Super cute Joy! I bet the kids love them! Thanks for sharing with SYC.